commercial divers and topside personnel. 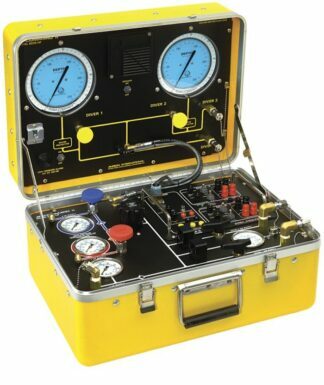 Each input has a 0-5000PSIG gauge and shut off valve to monitor and switch from one high pressure air source to the other. High pressure air is reduced to low pressure via a Tescom pressure reducing regulator with a pre-regulator in-line 50 micron filter. A 0-400PSIG gauge monitors the output pressure. A relief valve (factory set at 285PSIG) prevents over pressurization. The system can also be purchased with a heater element for diving in air temperatures below 45 degrees. The heating cable is wrapped around the HP input and regulator section located on backside of manifold panel. The standard plug connect 120 VAC heater is located on the front panel for ease of use. 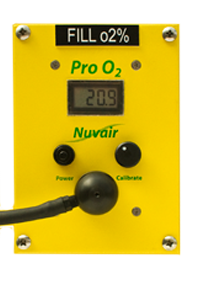 An air low pressure alarm monitors air pressure supplied to the commercial divers and activates an audio alarm alerting the tender of low air pressure conditions. 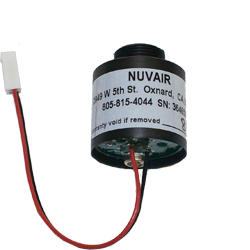 The air pressure switch is preset at 100 PSIG and can be manually adjusted to any air pressure between 22.5 and 112PSIG. Amron’s 2.4 GHz Wireless Tender Option includes: (1) 2829-11 wireless headset and transceiver. Additional 2829-11 Wireless Headset and Transceiver Kits can be purchased for use with the Wireless Tender Option as “listen only” devices, as only one headset on the system can listen and talk priority to the divers. The design allows the capability to add an unlimited number of remote listen only headsets for the topside personnel. The units operate on 2.4 GHz up to a range of 120 yards (110 meters).